When the weather turns warmer outside, many parents will head outdoors with their children to enjoy the sunshine. This is also true grandparents, who enjoy spending time outdoors with their grandchildren as well. It is important for you to not completely close your eyes to the potential dangers, however, and you’re about to learn one possibility. A man from Texas is showing the Internet a photograph he took of something that he discovered in his backyard. 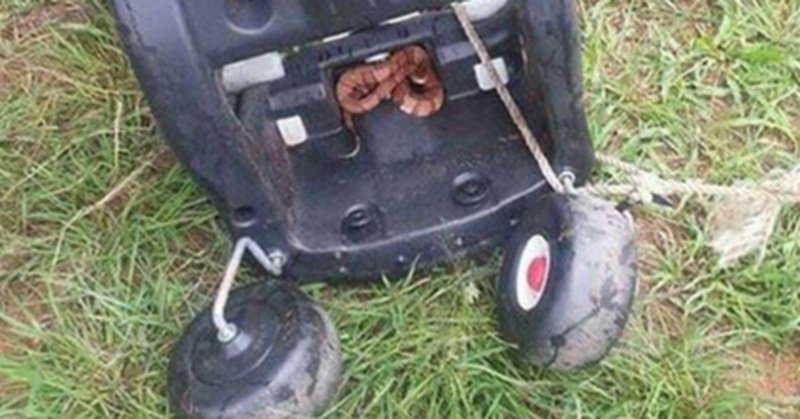 When he turned over his toddler’s toy vehicle, a snake was found curled up on the inside and hiding underneath. Unless the toy was flipped over, you would never know that it was actually there. This is terrifying, to be sure, and it may happen more often than you realize. Syd Miller is the Texas public figure who took this photograph and shared it on Facebook. It is a reminder that parents and grandparents should check the toys of their children to ensure that there isn’t anything hiding in them. The McLean family in Arkansas knows about this danger firsthand. Josh MacLean was playing outside with Johnson and Jasmine, his children. Johnson was playing with a toy dump truck and that is one his father heard the child screen. “I figured it was an ant or maybe a wasp,” Josh recalls. There was a snake hiding under the toy truck. It was a cottonmouth, sometimes known as a water moccasin and it is venomous. When Johnson turned the truck over, it bit him in the leg and he was rushed to the hospital. “He was in severe pain when we got there, the second day the same – but they took care of him the right way,” Josh said. The snakebite could have been deadly but the little boy was able to make it through. It took 16 vials of anti-venom to save the three-year-old boy. He is doing just fine after the ordeal but his story is a reminder for checking outdoor toys before children play with them. 1. Rodents – snakes eat rodents, birds and small reptiles. Be sure to keep birdfeeders and nesting boxes away from the house. 2. Moisture – irrigation may give you a green lawn, but it could also attract snakes. If you keep your garden and lawn watered, you may also attract birds, frogs and rodents that in turn, attract snakes. Be cautious around mulched and well watered areas. 3. Habitat – snakes like to hang out in cool, damp and protected areas. If you are near rocky streams or wooded areas, retaining walls or anything that gives the appearance of a cave, be cautious. Keep wood piles far away from the home and screen off areas under the porches or in crawlspaces. 4. Behavior – snakes are sluggish in the early spring and late fall and they may not be quick to move out of the way during those times. When the weather is warmer, snakes tend to be more active and move quickly. 5. Be cautious – check areas of the yard that could have a snake hiding. Use a pole and lift the items toward you so that the object is between you and the snake, if one is there. 6. Heads up – snakes don’t hear well but they do pick up vibrations. Make lots of noise when hiking or working outdoors. Be sure to share this with your friends on Facebookgrandchildren as well. It is important for you to not completely close your eyes to the potential dangers, however, and you’re about to learn one possibility. Useful Tips For Home Copyright © 2019.